The movie Amadeus made Mozart a household name. It did more to bring his music into everyday life than a thousand concerts and compact disks. Peter Shaffer’s screenplay is an inspired piece of storytelling. It tells of how Antonio Salieri plotted to defeat Mozart. It is full of imagination and intrigue. Unfortunately, it is not 100% true. Let us separate fact from fiction regarding Mozart’s death. The ceiling of Mozart's bedroom. 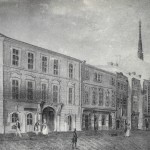 The apartment is now part of "Mozarthaus Vienna", a three-story museum right behind St. Stephen's Cathedral. For many years it was believed that Mozart was poisoned. These rumors started as early as New Year’s Eve, 1791. An obituary in the Berlin’s Musikalische Wochenblatt reported Mozart is—dead. He was sickly when he returned home from Prague and remained ailing since then . . . Because his body swelled up after his death, it is even believed that he was poisoned. At times Mozart even believed this. When he was working on the Requiem he told his wife, “I feel it very acutely. It won’t be long now: I’ve surely been given poison! I can’t let go of that thought.” Constanze never believed it. Rauhensteingasse 8, where Mozart died, with St. Stephen's in the background. The story strengthened when Salieri “confessed” that he poisoned Mozart. Salieri was delusional in the last years of his life. But few of the people who heard his “confession” believed him. Shortly before his death, Salieri put the record straight. He said, although this is my last illness, I can assure you on my word of honor that there is no truth to that absurd rumor; you know that I am supposed to have poisoned Mozart. If Mozart was not poisoned, then how did he die? The cause of death was first thought to be “feverish prickly heat.” Later it was thought to be a “liver condition with terminal uremia.” Currently two theories exist. A 1972 report suggests rheumatic fever. A more recent study proposes that Mozart had the following sequence of illnesses in his final three weeks: streptococcal infection, Schönlein-Henoch Syndrome, renal failure, venesection(s), cerebral hemorrhage, terminal broncho-pneumonia. 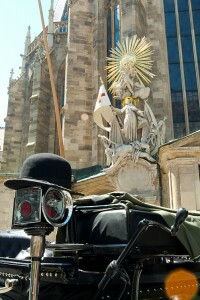 A Fiaker (Viennese Horse-Drawn Carriage) in front of the Crucifix Chapel, site of Mozart's consecration. Finally, let’s look at the Requiem. Was the commission conceived by Salieri as a way to drive Mozart mad? No. Was it some malicious plot to make Mozart believe he was writing a requiem for himself? No. Was it commissioned by an anonymous messenger? Yes, and that is where we need to begin. Count Franz Walsegg-Stuppach was a music lover and wealthy landowner from Lower Austria. On February 14, 1791, his young wife died. He came up an idea. He would commission Mozart to write a requiem mass that he would pass off as his own. It would be performed on the anniversary of his wife’s death. Walsegg-Stuppach asked a neighbor to be an anonymous messenger and contact the composer. The neighbor was Turkish. The foreign accent may have confused Mozart. Even after Mozart’s death, the Walsegg-Stuppach persisted with his deception. He copied the music (which had been completed by Mozart’s students) into his own handwriting. On December 11, 1793, he conducted it. It was entitled, “Requiem, composto del Conte Walsegg”! The site where Mozart died on December 5, 1791. Now a modern (and rather ugly!) department store with a plaque dedicated to Mozart. Mozart’s memorial was at the Crucifix Chapel, at the exit of the catacombs tour. There is a small memorial you can see from the outside of the building. A three-floor museum called “Mozarthaus Vienna”. Mozart lived here 1784-1787. 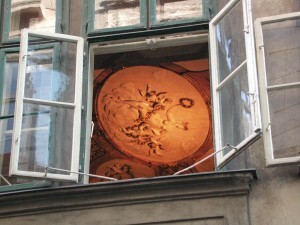 It was his home that was depicted in “Amadeus” although he died in another home (Rauhensteingasse 9, above). This museum is one of my Top 5 Musical Sites in Vienna. The parts of the Requiem that Mozart completed were performed here just five days after his death. You can see two plaques commemorating this to the right as you enter the church. Vienna’s largest park. Mozart and his wife were walking here when he told her that he felt he had been poisoned. 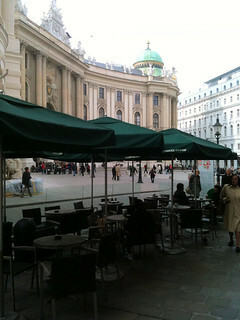 Vienna has some of the most famous coffee houses in the world, but you can still go to Starbucks across from the Hofburg! This entry was posted in Classical Music and Performers, Vienna's Musical History. Bookmark the permalink.